Can you give us an overview of your projects and work? I am part of some African blogs including Afrinnovator, AfricanDigitalArt and mark: my words (my own). Right now I’m changing up things a little career-wise, so I got some things I can chat about and a few others that I can’t. Not for a few weeks at least. Can social media revolutionise Africa? Not on its own. In and of itself it’s just the means, and it’s what we do with it that can revolutionise Africa. Across Africa and other emerging markets, social media is the #1 way people spend time on the internet, especially the mobile web as opposed to search which is #1 in developed countries. This shows how much root it has taken with Africans and coupled with the mobile phone, Africa is writing a new chapter of history for the innovation across the world. Do you think that great education is a prerequisite for the effectiveness of social media or do you rather think that new media are such strong players in themselves, that they can overcome poor education or even the lack of it? I think new media disrupts the old ways of education, but doesn’t replace it. It helps if one has the foundations and principles of good communication and understanding how human beings interact and participate in media. The democratisation of information is great, but then again with information overload and cognitive surplus, it’s as much where you look as what you look at. The mobile phone again offers new possibilities for education. Towards the future we could expect a shift from one laptop per child to one smartphone per child. How did you become interested in media in the first place and where do you think their appeal lies? 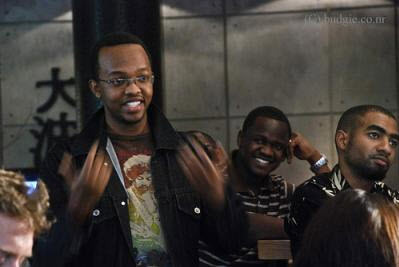 My upbringing saw me interact within a family that celebrated and appreciated the arts, which isn’t common in Kenya. My aunt is an actress and my uncle a sculptor. My mother is an interior designer and these have always been strong influences on me. Besides that appreciating theatre and performance as well as good communication led me to naturally incline towards media. The appeal of media is getting a conversation going and not just passing a message from one person to the other but tapping into new networks of people to do this at a pace and with an impact not witnessed by previous generations. You have quite a career in animation, advertising and communication consulting. I was wondering, what have you studied and have you found it useful for your subsequent path? I studied a number of things in very different learning environments. Business Information Technology and a course in Mobile Programming at Strathmore University in Nairobi, Leadership and Youth Ministry at an Institute in the United States and most recently learning business in a business acccelerator program as part of the Fellowship program at The Sinapis Group. You mention amongst other Strathmore, which is a private university in Nairobi. Do you feel you would have had the same chances had you gone to a public school? This is difficult to say. Private university allows you to begin studies as early as 3 months after you finish high school as opposed to 9 months to a year before you get into public university. My parents didn’t want me hanging around, but regardless I think I think the point in time I was at in my life and the environment I got into right after school shaped a large part of who I am today. Do you need inspiration, do you believe in it or do you perhaps think it is an overrated concept? I believe in renewal and inspiration as part of that process, I spend a lot of time online reading and going through content from great curators and online sources and that has become part of how I renew my mind. I also believe that inspiration is at times a blank page. I think some of my best ideas come not at the keyboard, but at my Moleskine notebook. How are great (or even revolutionary) ideas born? From threads of thought, correlated or not, threads of thought weaved and stitched together by sharing and openly discussing, critiquing and experimenting with the strands. I think the best ideas are those that are shared and spread among people. This is the genesis of a great idea. What do you think is lacking nowadays in the advertising/ visual communication world (if anything)? I’d say it differs from place to place. Globally we’re seeing the new dimension of narrative and storytelling picking up and taking over from traditional static advertising. Participation is a key theme in how messages come across and this is a trend seen most recently in some of the big winners at Cannes this year. Closer to home, Africa’s been looking at a crystal ball of what’s going on globally and South Africa’s the hotbed of creative talent and putting award-winning work on the world stage. Kenya’s got some ways to go, but don’t get me started on that. Although I don’t know your exact age I can tell from your websites that you have been active in the world of online media and communication for quite a while. How have seen their impact and that of the internet in general in Africa alter over the years (if at all)? I’m 23 years old but I’ve had a very different career path. I started working early when I got selected to write Warner Bros. first (and only) African videogame Pamoja Mtaani. I’ve been lucky enough to also travel a whole lot and experience learning and cultures across the world. One thing I’m certain of is that Africa’s been changing over the past few years. You are involved with the website AfricanDigitalArt.com among many things. How important do you think are platforms like ADA, which are clearly built on Western models of communication for emerging African artists? The thing about the way people perceive the internet and what it holds is not as something that comes from the web or from anywhere but more as a sandbox. Historically, it did come from the West, but no one views it this way. With AfricanDigitalArt.com there’s such an amazing creative class of African professionals across the continent and the world and for them to have a place to convene, create and collaborate is amazing. Do you see contemporary African (or Kenyan in particular) art reflecting social and political realities more perhaps than “Western” conceptual art? What can contemporary Kenyan artists offer to the country through their work? Africa’s rich history of textiles, craftsmanship and culture blend in to give a source of inspiration like no other place on earth. With this, as artists are indeed reflect popular culture and local reality you have styles, artists and techniques that emerge as a result. Both in contemporary art and in traditional art. I think Kenyan artists offer up a voice and rich critique. Do you have any favourite artists? If I wanted to get a sense of what’s going on artistically at the moment in Nairobi where would I have to start? Hard to say. Very hard to say. Really feeling Kronk, Ola Olowu and Lulu Kitololo. I noticed on your facebook, in the “About me” section you mention: Changing the way the world views Africa. What do you want to change about the world views Africa? What are some of the greatest misconceptions you feel? I think the African narrative has been more of an image and less of a conversation or dialogue and I’m passionate about changing this. There’s more to Africa than lions, war and diamonds. In the years to come the world will be looking to Africa to learn about using the mobile web for innovation in community, culture and commerce. How many hours per day do you spend online? Are you happy with the amount of time you invest in the virtual world or do you occasionally fantasise about disappearing somewhere remote where no new media can get hold of you? 8-10 hours a day, even more sometimes or less. It’s been one of the biggest things in my career, thanks in large part to Twitter which I’ve been on for 4 years. I’ve travelled the world because of it and have met some brilliant people as a result. I’m dependent on the web but I’m glad to unplug and get off the grid from time to time. What do you think is the greatest social media website so far and why? Social Network, hard to argue with Facebook. It very well could be the internet as we know it in a few years. Can you share with us some future projects that you are currently developing? In the coming weeks! Good things though!